Fall in love with the element of flexibility in an adaptive space born in a building constructed over 80 years ago and where original style is paired with historic features; providing an urban living experience that is truly unique. 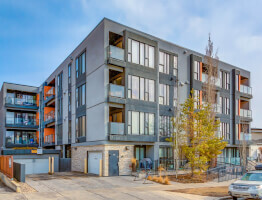 This unit features 20 foot soaring ceilings, an exposed brick wall, new carpet/porcelain tile, modern light selections including George Nelson Bubble Lamps, large south facing windows, a fireplace, main level den & an open concept kitchen with maple cabinetry. The lofted bedroom boasts a skylight, large closet and includes a 4 piece ensuite. 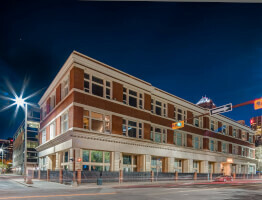 Imperial lofts offers great amenities which the other true warehouse conversions do not including a rooftop patio with communal BBQ & impressive downtown views, fitness facilities and a billiard/social room. Victoria Park, Calgary's original warehouse district offers boutique shopping, a food market, revitalized parks & streets, stylish dining & many new citizens.